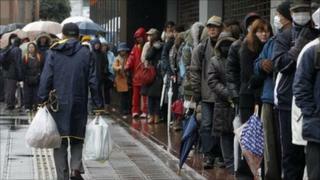 Why is there no looting in Japan after the earthquake? During a state of emergency it is not unusual to hear about looting, so why have there been very few reports of this in Japan? Commentators from across the media have their say. It's not possible to list them all but reports of looting during disasters are commonplace, like current reports from GNN Liberia on Liberian mercenaries being accused of looting in Ivory Coast. In the UK there have also been incidents, like Exeter's Express and Echo's report of people scavenging motorbikes on the Devon coast back in 2007, when the contents of a container ship were washed ashore. In the same year, police investigated reports of looting at flood-hit properties in West Yorkshire. The absence of stories of this kind has been noted by writers around the world. Slate's Christopher Beam says there's more to the lack of looting than honesty. He says that Japanese people are more honest than most, but adds the Japanese legal structure rewards honesty more than most. His other theories why there isn't any looting in Japan include the police presence and organised crime. "Police aren't the only ones on patrol since the earthquake hit," he says. "Members of Yakuza, Japan's organised crime syndicate, have been enforcing order." The Voice Of America's Steve Herman has been in Japan. He describes the country as "slowly grinding to a halt", which he puts down to traditional Japanese stoicism. "There's a touch of bitterness in a few voices and some subtle signs of frustration but no show of open anger," he says. The nearest Mr Herman gets to suggesting anyone taking advantage of the disaster is when he speculates that a black economy in rationed goods may rise up. To back up his prediction, Mr Herman cites the time this happened in the days after Japan's defeat in World War II. The idea that the Japanese are acting in some way against the grain in an emergency situation is challenged by columnist Johann Hari in the UK's Independent. He says the panicking disaster victim is a myth. He argues that in reality the vast majority of people behave in the aftermath as altruists, saving their fellow human beings and sharing what they have. He goes on to say the same predictions are made about every disaster. "Once the lid of a tightly policed civilization is knocked off for a second, humans will become beasts. But the opposite is the case. It sounds grotesque to say we should see reasons for hope as we watch in real time while the earth is shaken six inches on its axis, tsunamis roar, and nuclear power stations teeter on meltdown. But it is true." This, for Mr Hari, is proof enough to "kill off right-wing ideologies based on the belief that humans are inherently selfish". But US blogger Andrew Sullivan's readers have been disputing the story there is not looting in Japan. They've been sending in examples. According to a commenter on Mr Sullivan's blog the Daily Dish, who has been reading Japanese reports, they don't seem to be translated into English or reported on English language news sites. But, the commenter translates an article in Japan's 47 News citing 40 known cases of looting in Miyagi.